I was in my office when I received a call from Kevin Madden, the owner of Madden Media. I was familiar with Madden Media, the name of the company at the time, after having applied to and interviewed via phone with their sales manager years ago. Madden Media owns The Tucson Guide and Phoenix Valley Guide magazines, the Tucson Convention and Visitors Guide, and many others across the United States. Kevin and Jill Madden are local media icons in my eyes. He told me that he picked up a copy of Green Living magazine in Tucson at one of my local favorite French restaurants, Le Rendez-Vous. He complimented the magazine and thought that we might be interested in Aravaipa Farms. It was like getting a call from Chris Bianco, if you were a local emerging chef in the Phoenix food scene! He shared with me that Aravaipa Farms is an organic farm. He had purchased the farm from Carol Steele, who has been called the Godmother of the local Phoenix culinary scene. She is known for using local, farm-grown ingredients in her food and in Phoenix in the mid 70s to early 90s for her for C. Steele and Co., local market I used to frequent. It served delicious croissant sandwiches with turkey and Dofino cheese and incredible jams, other cheeses, and caviar. C Steele and Co Market was close to Brady’s Florist, which was where my sister had worked and Cathy’s Rum Cake. He said that Carol would join us for dinner Saturday night. My husband and I are foodies so I was honored to be invited and included. Kevin shared that it was an invitation to connect Aravaipa farms with media influencers. It is an hour and a half from Phoenix, through through Superior to the town of Winkelman. I love to travel in rural Arizona. The road trip was filled with beautiful purple mountains and beautiful cactus landscape. I took photos as we entered the area. As we approached Aravaipa Farms, we traveled across water to get to the gate. We opened the beautiful bronze gate and entered a luscious farm filled with pear, peach, and apricot trees. When we arrived at the main check in, we were greeted by Kevin and a farmer named Jake Bastine. Michael and his wife Poppy introduced themselves. Michael is a traveling photojournalist and Poppy is a nomad. There was an old truck filled with plants with a sign that said, organic Asian pears and farm fresh eggs, $3. Then we were greeted by Jill; she asked us if we wanted to tour the rooms and pick which one we wanted to stay in. This was a fun experience to see all of the rooms and how they were decorated to make their namesake. A few had been taken already. We choose the one with a tree house in the middle of it. We went down to the beautiful pool area for a little bit to enjoy the farm and the succulent trees. We decided to take a walk to the stream that we crossed when we entered the property. As we were walking, we saw raccoon tracks and other wildlife, then beautiful cows grazing. I realized how much I love cows. Then we walked back through the pear trees; it was the perfect temperature and the trees were heart-stirring. I love to eat fresh fruit from a tree, so I picked an asian pear. It was delicious and crisp. I am very picky when it comes to pears. They are normally too mushy for me. As we were walking I noticed a pomegranate tree. I picked one of those as well. We walked back to our room just in time to dress for dinner. We had brought a bottle of wine to share. As we walked up there were colorful glasses for wine. We gathered on the patio to learn who had been invited. There was a concierge from a Marriott hotel and his wife, an experiential event planner, travel photo journalist and his date and the lady of the evening, Carol Steele. I was lucky to sit next to Carol. We discussed Terry Brady of Brady Florist and Cathy Bua of Cathy’s Rum Cake. She shared with me about her artwork and love of jewelry making and some her life experiences She is an incredibly talented woman and entrepreneur. The dinner was set with festive centerpieces on a long table with hand-painted dishes. The chef was Polly Choate, who was trained by Carol Steele. The first course was salmon with a delicious beurre blanc sauce, sautéed asparagus, and roasted root vegetables. The dessert was a poached pear in red wine sauce with vanilla ice cream and garnished with pomegranate seeds – what an amuse bouche. We discussed who was going on the hike with Kevin the next morning. Mark and I were the only ones that were going. Jill told me I needed hiking socks. After dinner we enjoyed a glass of wine with Kevin, Jill, and Polly and then a wonderful night sleep on a very comfortable mattress. We woke up and made delicious coffee. The fridge had yogurt, deliciously sharp cheese, and fresh squeezed juice in it. On the counter was delicious granola and succulent fruit muffins which I normally do not eat. I had 1 and half. Jill came by to lend me the socks for the hike and walking sticks. Kevin picked us up at 10:30 AM and we were off. He showed us where Carol lives and his neighbors’ houses. They were all beautiful homes. There is a bridge that you cross going into the canyon. Kevin shared a story of how he saw the bighorn sheep right next to bridge. He said it was an incredible experience. The view was breathtaking. We walked down to the canyon. Once we got to the canyon, we were walking in water. There was a lot of raccoon, cow, and coyote prints in the sand. Kevin talked about the history of canyon and the Camp massacre. The attack was in 1871, against Pinal and Aravaipa Apaches who surrendered to the U.S. Army at Camp Grant Arizona along the San Pedro River. The river had native fish, birds, and incredible wildlife. We enjoyed educational and inspirational conversation with Kevin. He talked about his three daughters and that one of them was coming to work for Madden and the other was going to work on the farm. She was very interested in sustainable food systems. His other daughter is studying to be a nurse. We walked through a beautiful swarm of butterflies. Butterflies are symbolic of new beginnings. After going on one of the best hikes of my life, we saw Polly at a neighboring house that had pomegranates. They gave me a pomegranate and it was the best pomegranate that I have ever eaten. Kevin raved to Polly how much he enjoyed the poached pear. We journeyed back to the property and packed up. While we were walking Kevin had shared with us that he was selling pears to the Tucson Unified School District. Kevin showed us the 48 cases of pears he was taking. I had never seen so many pears. We had a tantalizing lunch of tuna fish salad with thin bread, fresh fruit, and leafy greens that Laura, the inn keeper, had prepared for us. It was a magical experience filled with many new beginnings. Aravaipa Farms is a place for everyone. It is an environmentalist’s, hiker’s, foodie’s, birder’s, photographer’s, artist’s and yogi’s dream. 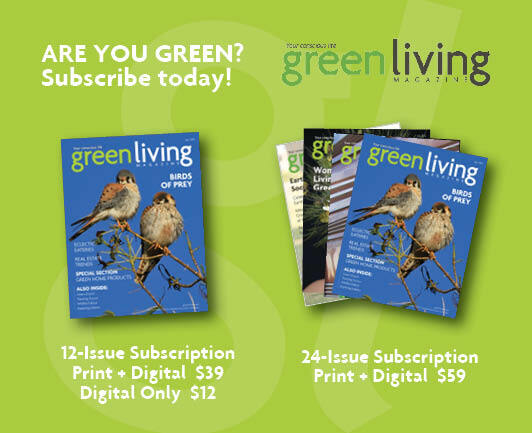 As the publisher and editor in chief of Green Living magazine, Dorie Morales turns living green into an art form fully embracing the idea of living, working and playing green. Her vision of a sustainable future drives the magazine, educating, empowering and inspiring readers to make their own eco-conscious choices for the betterment of the planet. Wow, what a wonderful review. Will add it to my bucket list!